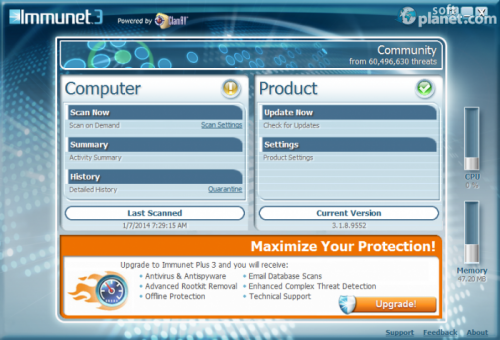 SoftPlanet makes it possible for everyone to get free Immunet Free Antivirus download directly from our servers. There is no registration needed for downloading. Cloud-based antivirus programs become more common, since even some classic ones move towards this solution. It gives a lot of advantages, but some of the most important ones include that virus definitions get regular updates. Immunet 3.1.13.9671 is one of the apps that offers this advantage, but it adds some new ones that will make you like this program. One of the most important advantages is that this app is free, as the name suggests, but it is also compatible with other antivirus programs, which means that you can use it as second layer protection. While you use different programs and install different apps Immunet monitors how the programs start and what happens during their installation processes. 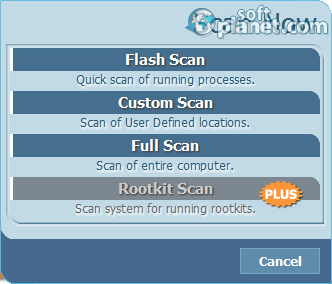 If you want to see if any malware passed by this live protection you can use Flash, Custom or Full Scan. The program also lets you switch on and off the cloud detection engines, if for some reason you find them unwanted. Immunet has a nice interface that has a nice blue color. The only thing that differentiates the app from the rest is that there is an annoying orange commercial that offers you to install the paid version of Immunet. It comes with a trial period so if you want to test it you can do it for free. The rest of the interface is standard for antivirus programs so you will not find it hard to use. While we tested Immunet 3.1.13.9671 we performed a full scan with it and it scanned 96,610 files in 14.11 minutes. It didn't detect any threat, which is not something that is strange, because the test was done on a computer with a newly installed operating system. But this scan time is quick, so it is no wonder that the developer brags about its lightness and speed. The lightness was proven by the fact that the app didn't slow down the PC at all during the scan. When it comes to scanning your PC Immunet is one of the fastest antivirus programs that we have tested until now. The app has some other good sides, like for example it can be used as second layer protection, because it is compatible with other antivirus applications. It is also cloud-based which has some advantages on its own. Immunet Free Antivirus is VIRUS-FREE! Our security scan shows that Immunet Free Antivirus is clean from viruses. The current version of Immunet Free Antivirus has been scanned by our system, which contains 46 different anti-virus algorithms. That ensures that Immunet Free Antivirus 3.1.13.9671 is 100% safe for your computer.